“French cuisine” and “Super Bowl”? Look, if we can embrace Mexican and Italian and the Earl of Sandwich, I submit that Choucroute garnie is the perfect entrée for French food to join the Super Bowl party. Choucroute garnie simply means “dressed sauerkraut.” It is one of the traditional dishes from Alsace, a region in Northeast France on the German border. Choucroute is usually eaten in wintertime because it is so hearty and filling. 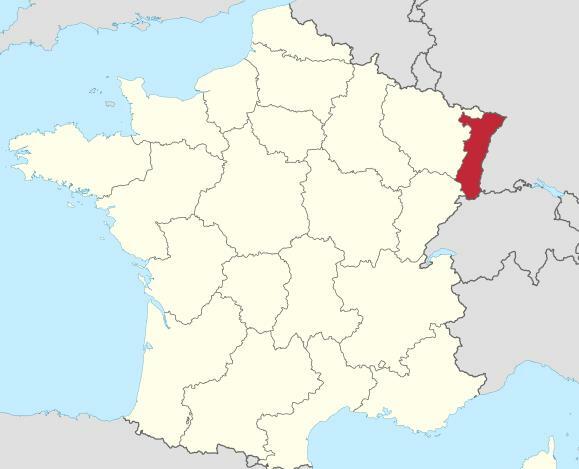 Alsace changed hands between France and Germany numerous times, but has been part of France since the end of World War II. Its location resulted in a unique blending of French and German cuisines. 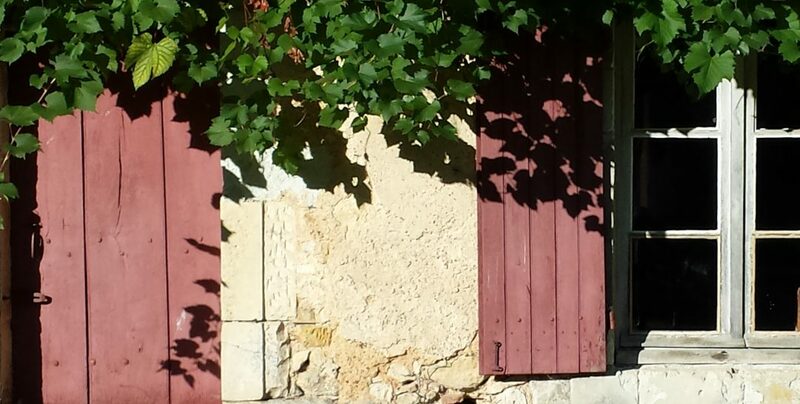 Alsace is a noted wine region, producing distinctly Alsatian dry Rieslings and aromatic Gewürztraminer wines. Back to Choucroute. Why do I think it should join the Super Bowl spread? There are several reasons. First, forget it’s French. Here in U.S. hot dogs are often covered with a blanket of sauerkraut and mustard. Choucroute garnie is just a tricked out version. Second, it feeds a crowd. It’s full of pork—manly, football pork. And third, it can be made ahead of time, either in the oven or—my favorite—in a crockpot. Best of all, the succulent components can be piled into a roll with some hearty brown mustard, making one delicious sandwich. It is simple to make. A few steps are added to the familiar pork and sauerkraut casserole, wine is added as a braising liquid, and an assortment of smoked and unsmoked pork, bacon, and sausages are layered with sauerkraut until the pot is filled. A few spices are added, then it braises for several hours. Done. 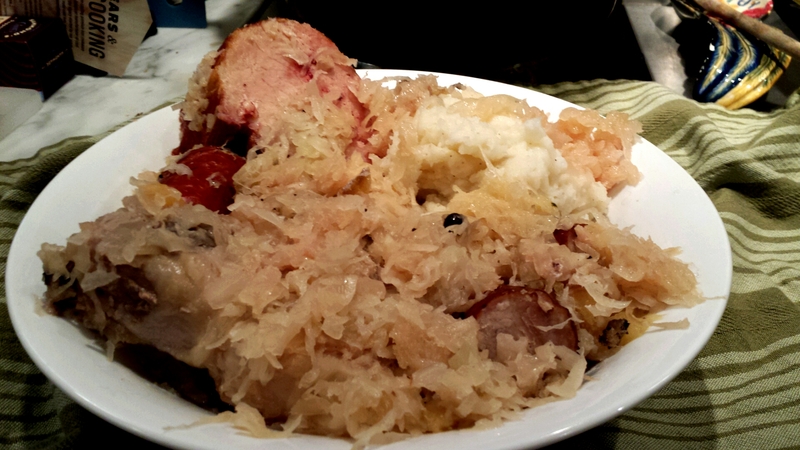 Choucroute traditionally is served with boiled potatoes; mashed potatoes are equally delicious. The technique used for this is braising, which means there is fat involved. Some recipes call for layers of lard or fatback. Others use goose or duck fat. Peanut or other mild vegetable oil will work, as well. If you can find a dry Riesling wine, please use it. I’m not sure you’ll taste the difference but you will feel very Alsatian at the end. A dry white wine, vermouth, a bit of gin, beer, or even apple cider can be used in place of Riesling. If you use the oven method, count on three to four hours of cook time. If using a slow cooker, cook time will be seven to eight carefree hours. 4 sausages—bratwurst, veal sausages, hot dogs, etc. Drain the sauerkraut and empty it into a basin of cold water. Rinse well and squeeze dry. Pull the sauerkraut apart to loosen any lumps. Tie the cloves, juniper berries, peppercorns, coriander, thyme, bay leaf, and garlic into a cheesecloth bundle. Add the kielbasa to the sauerkraut for the last hour of cooking. 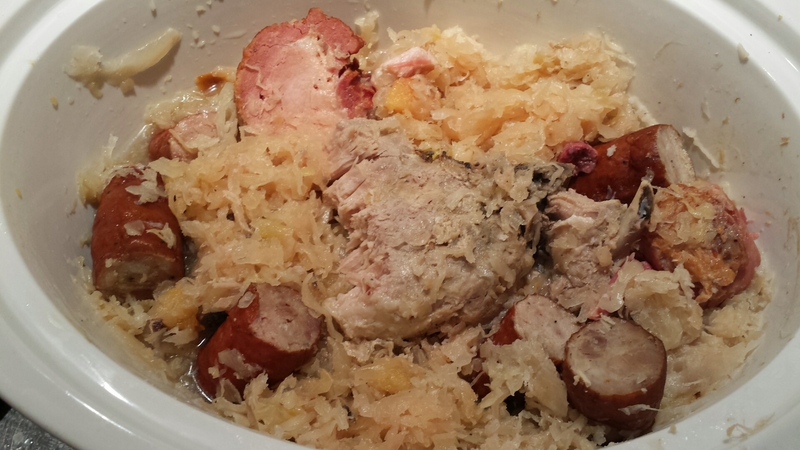 [Slow cookers: bury the sausages in the sauerkraut, turn the cooker to high, and continue cooking for 1 hour. Remove the cheesecloth bag from the sauerkraut and discard them. Spoon the sauerkraut onto a hot serving platter and garnish with pork and sausages. OMG Verlee, I love choucroute! It was our traditional Sunday dinner for years because when coming back into Paris late Sunday evenings it was so easy to get on the table. Although yours probably tastes better, my version is really easy. I buy the prepared choucroute and for the garni, a couple of frankfurt sausages, smoked sausages and a jambonneau (no fresh meat). Put the choucroute in a steaming basket with the meats on top. Steam for a few minutes and voila! I don’t do the potatoes. Just serve with some dijon mustard and of course an nice reisling. Takes about 10 minutes to get on the table which leaves time to do homework.. or watch a football game! Soon I will prepare my own choucroute though, try your version and let you know how it turns out.